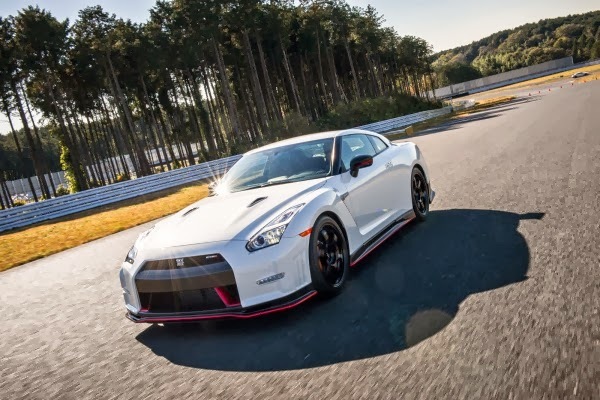 Edmunds put a few laps on the new 600 horsepower 2015 Nissan GT-R NISMO recently. In their last test, the 2014 Corvette Stingray beat the 2014 Track Edition Nissan GT-R.
Nismo form the 3.8-liter twin-turbo V6 cranks out a whopping 600 hp at 6,800 rpm (up from 545 at 6,400) along with 481 pound-feet of torque at 3,200 rpm, an 18 lb-ft increase. Nissan has yet to release pricing on the 2015 Nissan GT-R Nismo, since it won't arrive in the States until summer. But converting yen to dollars tells us that it'll likely fall somewhere between $130,000 and $150,000. A lot of money, yes, but this certainly seems like one ferociously fast GT-R. We'll tell you for sure after a few more laps. Head over to Edmunds for the full article and all the pictures.